Reverse charge is a scenario in Taxation, where, the tax paying entity creates a tax liability on it self. One of the examples of this is India GST, where reverse charge needs to be applicable under specific scenarios, such as Purchase from Unregistered Vendors, Import of services and Purchase of specific Goods and Services. To understand it better, let us take the an example. An organization purchases goods from a supplier. That supplier is not eligible/registered to pay taxes to government. The rule in that particular tax regime tells that, in such case, the buyer needs to create a tax liability on itself and submit the tax amount to government. This concept is called reverse charge. Let’s talk about it from an accounting point of view. In case of a normal purchase, the accounting entry will be as it below. 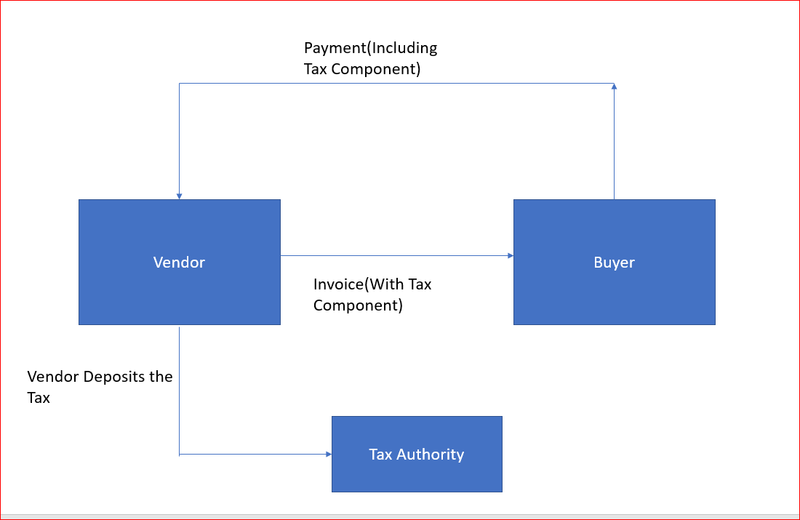 In this case, the buying organization pays the tax amount to the Vendor(in the payment against invoice), who in turn will submit it to the government. In case of a reverse charge, the accounting entry will be as below. Here the Output tax line indicated that the organization is liable to pay the tax amount to Government directly. i. 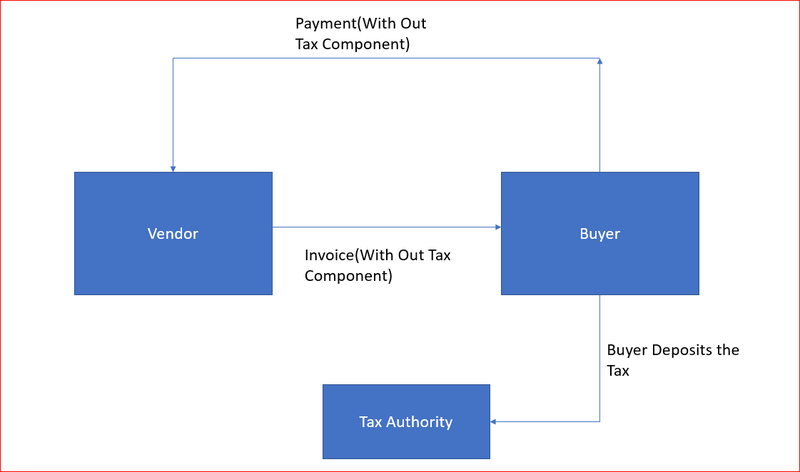 Condition Type Set up in Tax Procedure. Condition Type for Both components of the reverse charge needs to be set up in the tax procedure. In the below snapshot, ZP2 and ZP3 are these condition types. iii. Define GL accounts for these two components. Then using this Tax code creates a document with reverse charge. Please note that, for countries with condition based tax Procedure (India/Brazil) this will require a separate set up. That can be discussed as another section. The above explanation is applicable for countries with a formula based tax procedure. 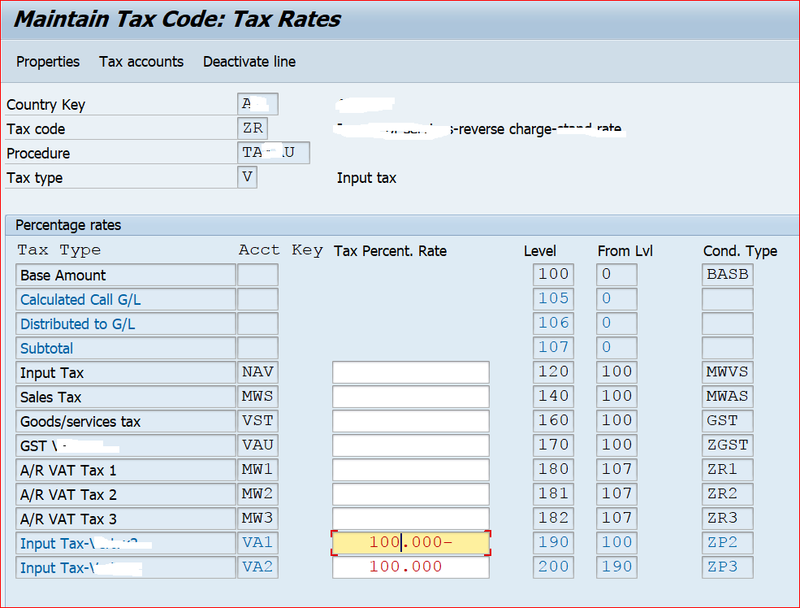 The Screenshot under comment Condition Type Set up in Tax Procedure ZP3 calculated from step 190 and ZP2 from step 100 (assuming Step 100 is base amount). As per me its both ZP3 and ZP2 should be calculated from step 100 to have null effect if I am using % as tax percentage rate. Let me know if I am correct.